“Wealth, fame, power. Gold Roger, the King of the Pirates, obtained this and everything else the world had to offer. And his dying words drove countless souls to the seas. One Piece is an Action/Comedy based on the ongoing manga (64 volumes and counting) by Eiichiro Oda back in 1997. The anime is from Toei Animation and began running in Japan in October of 1999. 4Kids held the rights to the series from 2004 to 2007, with FUNimation taking them shortly afterward and is currently holding them today. 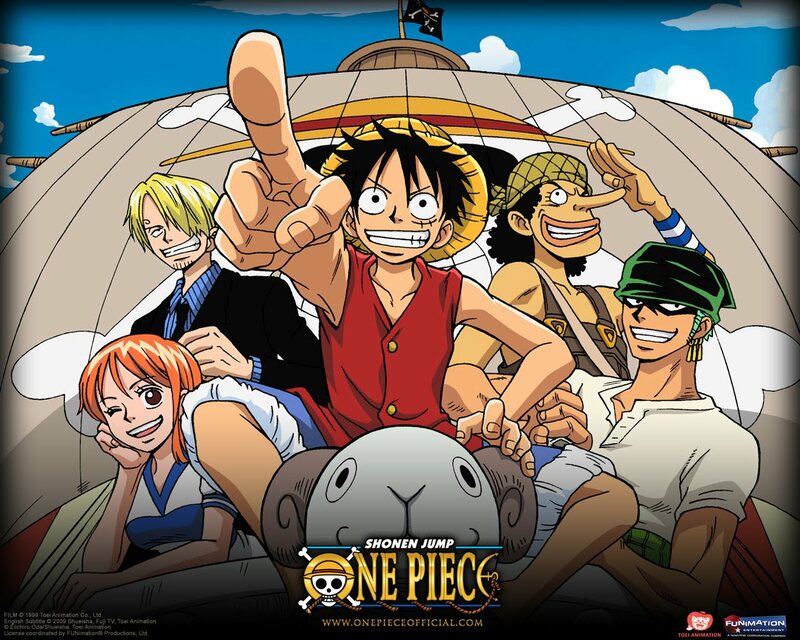 Season one of One Piece (out of 14 seasons and counting) holds 62 episodes and ran from 1999 to 2001. 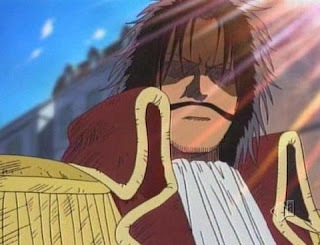 The series begins with the execution of Gol D. Roger, a man known as the King of the Pirates. Before his death, he told the legend of his treasure, the One Piece. Roger's death caused a Great Pirate Era as countless pirates set out to look for his treasure. Twenty years have passed since Roger's execution, and Monkey D. Luffy, a young boy inspired by the pirate known as "Red-Haired" Shanks, sets off on a journey from the East Blue to succeed Roger and find the treasure. Along the way, he organizes and leads a crew named the Straw Hat Pirates. 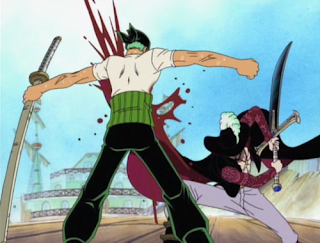 The crew consists of a swordsman named Roronoa Zoro; the navigator and thief Nami; the liar and cowardly sharpshooter Usopp; and the womanizing chef Sanji. Together, this young crew travels the East Blue in search of adventure and a lot of laughs along the way. Alright, I said I was never going to review anime with over 50 episodes, but this one cannot be helped. Considering I looked at Monster for a review later on this year, and that was 74 episodes long..... Although One Piece has over 500..... And still counting..... This one is an anime I really wanted to do since I watched it as a kid, so I decided to spare you and I the trouble of going through ALL the episodes for one review and just review by season. Since, as the years go by, things end up changing anyway, production wise.... Another thing to note while reading this review, and the many more to come, I decided to strictly watch the FUNimation dub. I’ll make some comparisons to 4Kids every now again, but that’s it. With all that said, let’s set sail for season one! I’m going to start things off a little differently and talk about the story first. 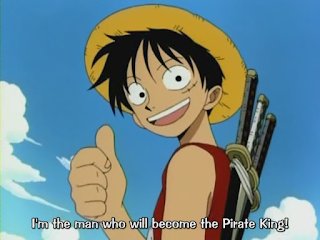 The first season is pretty much about Luffy starting out on his journey and gathering a crew together. 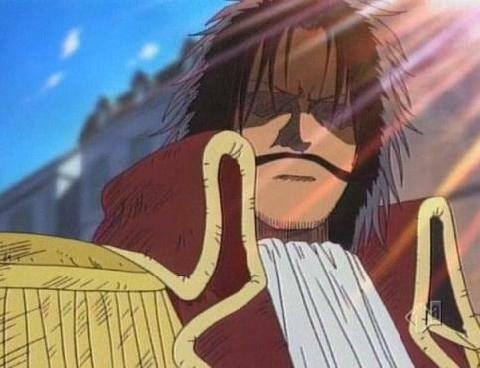 After he gains his four crew members, and encounter many other pirates along the way (Alvida, Buggy, Kuro, and Don Krieg), they fight off a few more pirates and some Marines as they make their way into the Grand Line. Is the story good? ......Kinda. There’s a couple things that stand in it’s way from making it truly amazing. The first being, it’s a shonen series. Yeah, I know, there can be good shonen like Yu Yu Hakusho and then ok ones like Bleach and Naruto. One Piece is more of a decent shonen, in between good and ok. It follows the same kind of formula as any other shonen series, so don’t expect anything unique. The other problem the story has is it’s constant amount of comedy. For an anime about pirates, you would think the series would be serious with the pirates out for blood and glory. Instead (and I know this metaphor has been used A LOT) you basically have the anime form of Jackass. 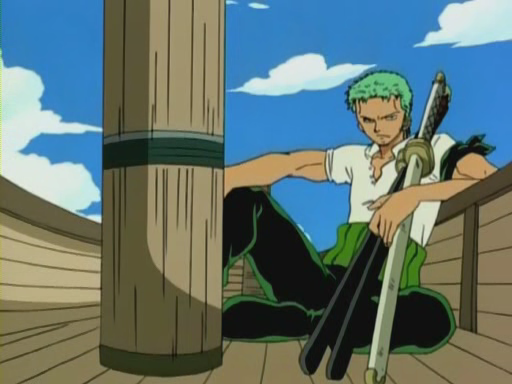 It has it’s serious moments and serious characters, like Zoro, to make the series seem awesome and cool. But even the serious characters get caught up in the goofy hijinks, making the tone of the series suffer. But there is a plus side here. 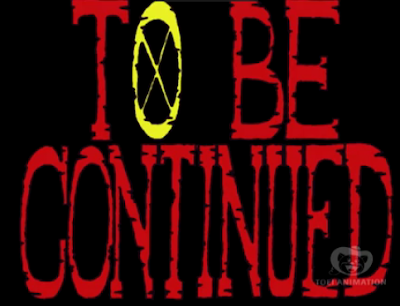 One Piece is in NO way afraid of making fun of how silly it is, wearing it like a Badge of Honor. From characters asking the questions the audience is asking for us or trying to make a running gag stop. One Piece could be a parody of the shonen genre, but only really could be if it wanted to. On the technical side of things, this is Toei Animation, the same company that brought us the Dragon Ball Z franchise, the Sailor Moon franchise, and the Digimon franchise (What is it with Toei and franchises?). Also, this is animation that began in the late 90’s, better quality than Trigun yet far from Cowboy Bebop. That’s really the best way I can put season one. And it grows on you very quickly. When I first watched this series as a kid (yes, 14 years old is a kid, shut up), I was hooked instantly by how fun and silly the worlds were and even what character designs looked like. It’s bright, colorful, has really weird looking characters...... Again, the series isn’t afraid of looking silly. And the music is simple, adventure type, music. From high action on the high seas to dark, sad, or even depressing moments. For a shonen/comedy, there really isn’t a lot to criticize here because of the comedy genre attached to it as well as it’s own fearlessness in the silliness department. As for characters, you have a WIDE variety of characters to fall in love with. From the serious cut throats like Zoro and Captain Kuro, to the moderately intelligent yet still lovable like Usopp, Sanji, and Nami, to even the most stupid and insane characters in existence like Luffy and Buggy. After a while, you will find your favorite to root for, good or bad. As for our band of Straw Hat Pirates, their interactions can be some of the most fun and hilarious bits in any shonen I’ve ever watched. So far, each of the five members follows some sort of stereotype and they remain as that stereotype for the entirety of the season. They each do gain life lessons and learn new things along the way, aside from Luffy, but their personalities are dead set. Now for the FUNimation dub. THANK GOD THIS EXISTS!! You have no idea how I felt when I heard the news that FUNimation was the new licensor of One Piece. Actually, at first, I didn’t even know what was happening. Back when One Piece was airing on Toonami, it was the 4Kids dub. Then one weekend it switched to the FUNimation dub and I became so confused and missed the 4Kids version so much that I stopped watching the series. A few years later, and some reading up on anime in general, I picked it up again, from the beginning, with the new dub. And it far exceeded my expectations. There are many improvements, and a few that actually made me miss the 4Kids dub (Weird, right?). 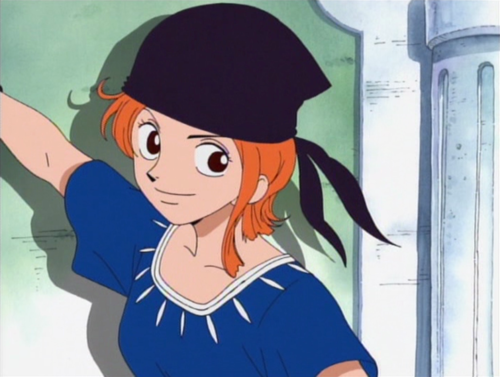 Nami voiced by Luci Christian (Princess Tutu, Soul Eater), one of my favorite voice actors of all time. Christian is the perfect choice for this role playing all the different parts of this character well and making it flow as natural as this series gets. Being happy, scheming, seductive, and even angry is done with ease for Miss Christian. 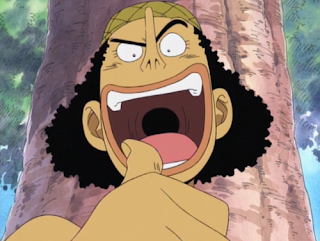 Now for our fourth Straw Hat Pirate, Usopp, voiced by Sonny Strait (Lupin III, Dragon Ball). Usopp has always been a fun character to watch for the, near, same amount of goofiness as Luffy, but more cowardly; something that Strait played with amazingly! You can really tell when the character is trying to show how awesome he is, when he actually isn’t. Last, but certainly not least, you have Sanji voiced by Eric Vale (Fruits Basket, Sengoku Basara). BIGGEST IMPROVEMENT EVAR!!! 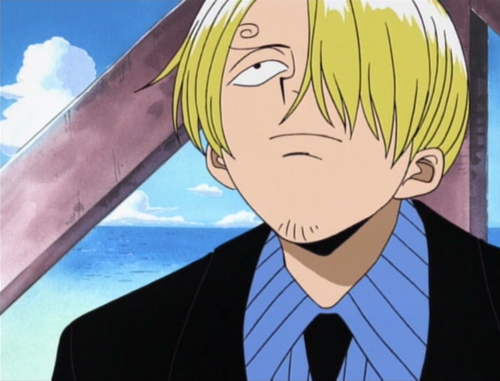 As my favorite character of the series, Sanji has always been my little anime crush and, as such, needed to be treated with respect. UNLIKE THAT STUPID 4KIDS DUB THAT MADE HIM SOUND LIKE A RETARDED BABOON!!! Vale’s version is exactly how I imagined the character to be. Hotheaded and mature yet a love sick puppy and just as goofy as the rest. As for the rest of the cast, it’s so colorful and a wide variety that I can’t go into complete detail. Instead, I’ll have to give you the short version on some of my favorites. 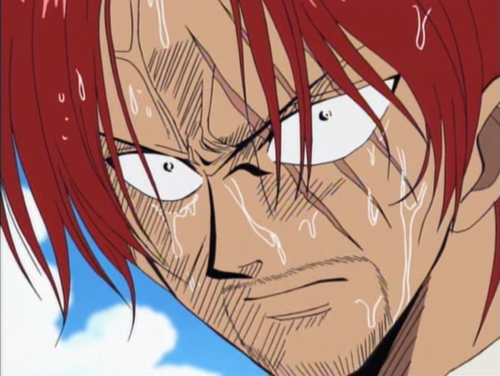 First is Brandon Potter (Black Cat, School Rumble) as Red-Haired Shanks. Enough fun and cool guy to make me squee. Then you have Mike McFarland (Monster, Romeo X Juliet) as Buggy the Clown. This cut throat pig is a fun reoccurring character to watch and I can’t wait to see more from him as the series rolls on. Next is Kent Williams (Baccano!, Eden of the East) as Captain Kuro. This one time villain is a fun and devious one to watch on screen, and is one of my favorite One Piece villains so far. One to point out is J. Michael Tatum (Baccano!, Spice and Wolf) as Pearl, a Don Krieg Pirate. For some reason.... I kinda had a feeling this would just fit well. Grant James (Eden of the East: Paradise Lost, Summer Wars), who voiced Sanji’s old mentor Zeff, is another favorite of the first season. The last character I want to mention from season one is Smoker, voiced by Greg Dulcie (Bamboo Blade, Claymore). Certainly one tough Marine you don’t want to mess with. So many good memories. I never really saw the dubs that much, but I still fondly remember this part of the series. Even if a part of me couldn't help wonder when the hell they would get to Grand Line. sounds good in giving brief review to the characters. I wish you include my favorite man in the series, one piece ace. I knew you already knew him. Why i love him because of his heroism he done for luffy,as a matter of fact i do include him at my collection of character from PIJ. Have you seen his death episode? Yerocha, i suggest to follow through all the episode to see for yourself.